Out In Brooklyn. Speaking Out For Peace In Syria / Iraq! We were out today continuing Brooklyn For Peace's campaign to inject the voice of the peace movement into the discussion on the war in Syriia / Iraq. Oh...what discussion? It has virtually disappeared from coverage in the nation's controlled media...but there's a war going on there and the U.S. is in the thick of it...once again. Some people think ISIS is so evil that U.S. military action is necessary to stop them. Others say "we've been here before, in Iraq and Afghanistan." It's a slippery slope to a full-scale war like the two trillion dollar wars over the last 12 years. 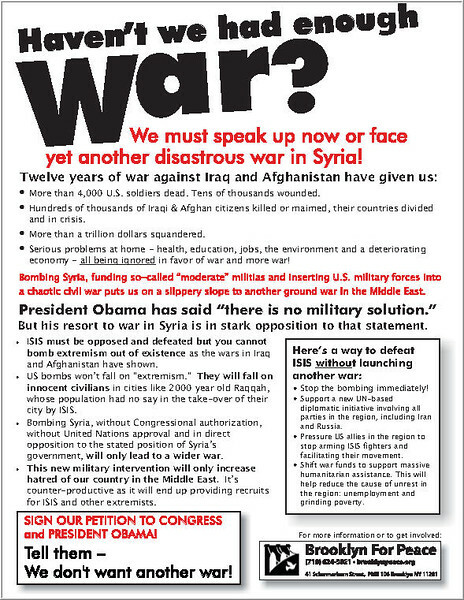 Many Brooklynites seem to agree - we've handed out some 1500 flyers over the last week and collected dozens and dozens of signatures on petitions to Congress that say 'We don't want another war in the Mid-East." Here are photos from today's tabling at Grand Army Plaza's Central Library. Our Peace Campaign continues as long as the weather holds - we'll be out on weekends and weekdays on street corners around the borough. Join us! Write to pej@brooklynpeace.org for locations and details! The flyer that's been distributed to Brooklyn residents over the past week or so.